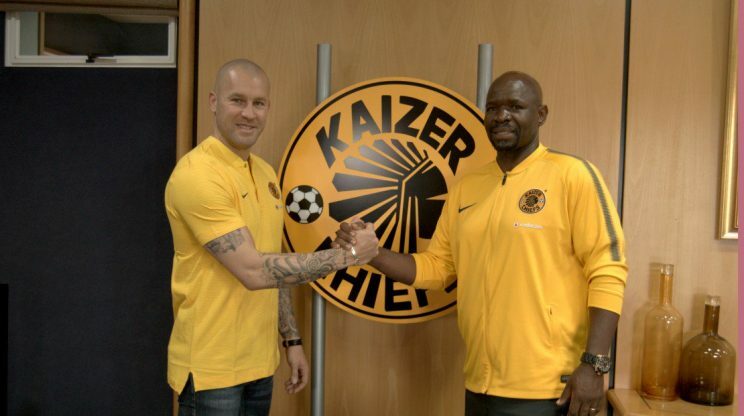 Kaizer Chiefs head coach Steve Komphela and goalkeeper coach Lee Baxter. Kaizer Chiefs communications manager Vina Maphosa says Lee Baxter joined Amakhosi to fill the vacant position left by the late Alexandre Revoredo, not to replace Brian Baloyi. Following Chiefs’ announcement about Baxter’s appointment, many believed that he was there to replace the club legend, who has been standing in as goalkeeper coach since Revoredo died, but Maphosa says that’s not the case. “Baxter is employed to fill a vacant position in the team, it was left by Revoredo. I can’t answer you on what Brian’s role is within the club’s goalkeeping structures but what I will tell you is that he is still with us and is part of our goalkeeping department. When we employ a person they come in to fill a vacancy that is there not to take the other person’s job,” Maphosa told Phakaaathi.